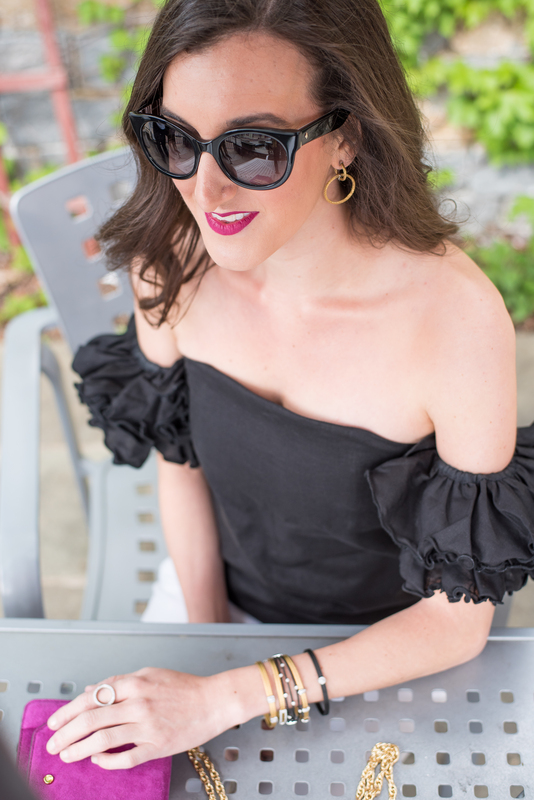 Today I’m bringing you another look in collaboration with Richter & Phillips! The jewelry I’m wearing today is by the brand ALOR and it’s available for purchase at Richter & Phillips. Also, click here to check out the first collaboration post! 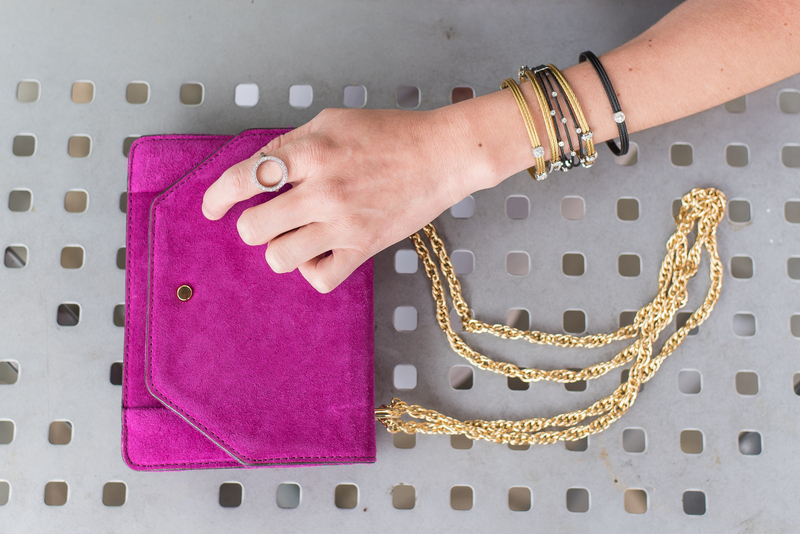 ALOR jewelry is best known for its sleek pieces made of cable, giving it a unique look that stands out. I knew when I saw the pieces that I wanted to create a stacked look. That’s what I love about ALOR, the jewelry looks great on its own but it really makes a statement when you mix and match the different cable pieces. I went with a mix of black and gold pieces, and love how they paired together. 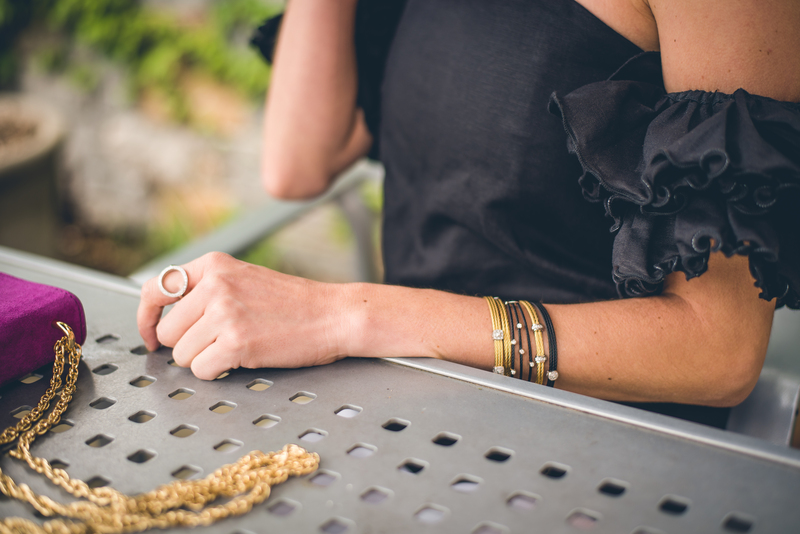 I’m wearing five different bracelets and each piece is a little bit different, creating a nice contrast. My ring and earrings are also from ALOR and available at Richter and Phillips. I knew I wanted a simple but chic outfit to go with these ALOR pieces. 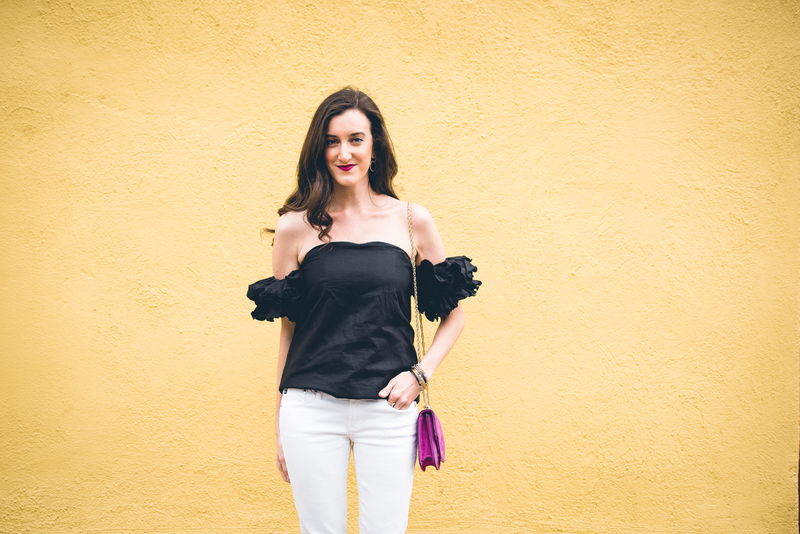 These white jeans and black ruffled off the shoulder top were a perfect choice to make the jewelry stand out. 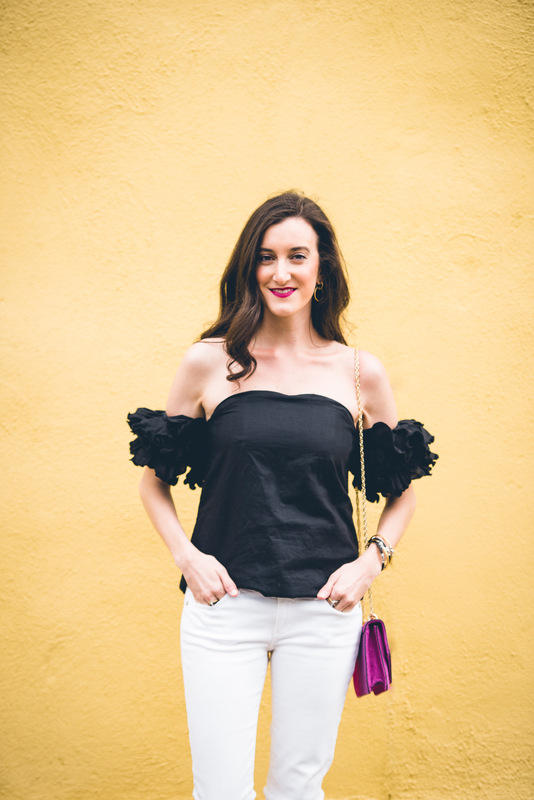 I am seriously obsessed with this Isla off the shoulder top and love the ruffled statement sleeves. 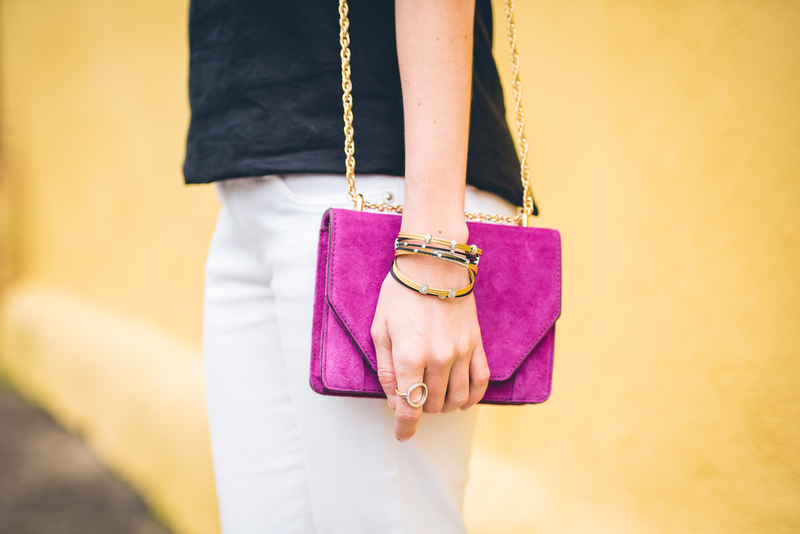 To add a pop of color I went with this purple suede clutch from Banana Republic. Kicking off the Holidays with Stafford Jewelers + a DISCOUNT! I cannot say how much I LOVE these collaboration posts from you! That top is STUNNING on you the the jewelry? DREAMY! You are so sweet, Alissa!! That makes my day! Such a great ensemble! 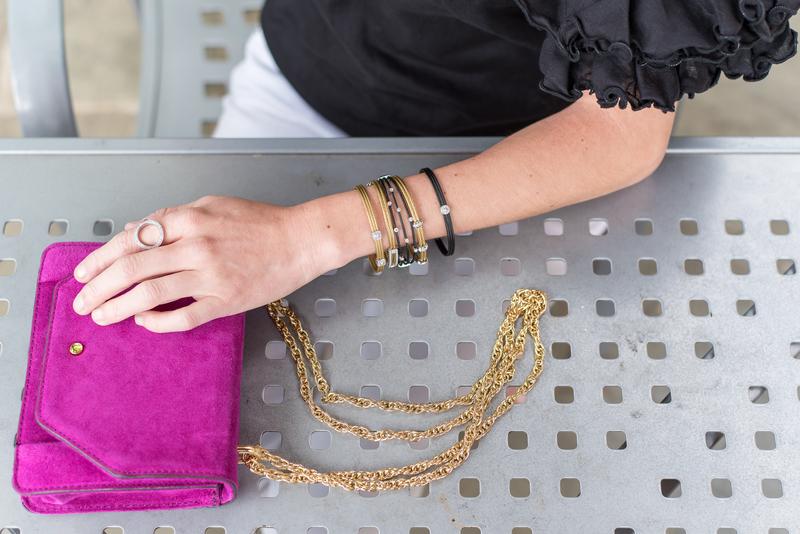 I love mixing and matching tons of bracelets.